A beautiful, vintage, travel promotional poster, featuring two elegant, chic, fashionably dressed ladies with a bouquet of flowers, under a canopy of leaves; the famous Madrid landmark - the neo-classical Puerta de Alcalá or Alcalá Gate, in the background; and the words 'Madrid Temporada de Primavera' (Madrid spring season, in english), at the bottom. 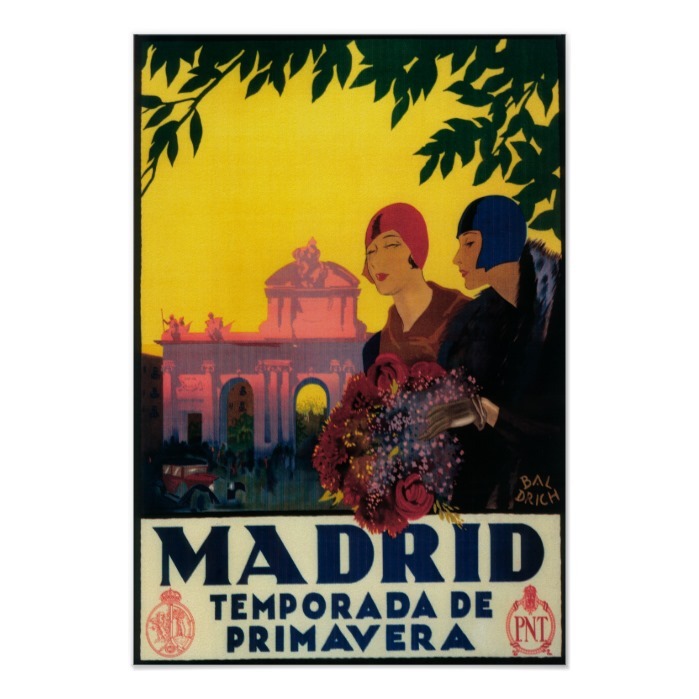 An elegant, vintage poster, created in 1930, promoting travel to Madrid, Spain, in springtime. This artwork is also available on other products, like luggage tag, tote, keychain, postage stamp, iPad case, iPhone case, and more. A beautiful vintage art custom poster, great for home and office decor. You may even get the print framed while ordering.